A fine sophomore release from the Czech five piece. 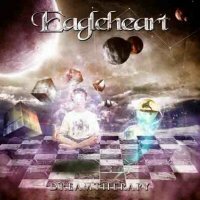 Eagleheart is a power metal band from the Czech Republic founded by guitarist Michal Kus back in 2003. They went through several line up changes before recording their demo 'Black Sun' in 2005. In 2007 they won a competition to record in a fully equipped studio and the end result was the band's debut album 'Moment Of Life'. Heavy promotion on the tour circuit followed with the likes of Blaze Bailey, WASP and House Of Lords. Eagleheart currently consists of Vojta Simonik (vocals), Kus (guitars), Michal Jankuliak (guitars), Jiri Fiala (bass) and Zdenek Vemola (drums). New album 'Dreamtherapy' is yet another album that opens with an instrumental, this one full of effects and swirling keyboards. Suddenly the full force of the drums and guitars are unleashed and 'Shades Of Nothing' screams into existence. This is a track full of galloping pace in the rhythm section plus some soaring progressions on the guitars. The title track and 'Burned By The Sun' follow a similar formula with breakneck speed whilst the guitars dual away with thundering riffs and scorching solos. But the album has much more variety to offer. 'Creator Of Time' opens with a melodic harmony of which Ten could be exceedingly proud!. It then breaks into a slower melodic but crunchy riff which powers the track throughout. With its very catchy progression this is the best and most memorable track. By comparison 'Glass Mountain' opens with an oppressive thrash riff that Megadeth would be more than happy with before reverting to a more traditional power metal sound. 'Dreamtherapy' also offers up slower material such as the heavy power ballad 'Nothing Remains'. The closing track has a slightly progressive feel to it due to its varying styled riffs, differing pace and more complex composition. It is also the longest track by some way at over 12 minutes. This is a belter of a power metal album. Given the different style of progressions on the guitar it's tough to give a truly accurate comparison. However it would be fair to say that Eagleheart do bear a passing resemblance to Pretty Maids, albeit the heavier and faster side. This is especially true of the vocals with Simonik's mostly gruff style being very comparable to Ronnie Atkins! Musically the band is quite impressive, combining some modern riffs along with some truly delicious licks on the fret board. The production and technical side of the album has been well handled by Roland Grapow, (Helloween & Masterplan), and despite a real tour de force coming through the speakers; it remains crisp and clear. This album has enough of a classic sound to appeal to traditional power metal lovers. But it also has plenty of variety and freshness to have the potential to appeal to fans of other metal genres. A fine sophomore release from the Czech five piece and one that metal fans should take a good look at.